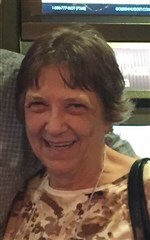 Carolyn Helmken, 74, passed away on Monday, November 26, 2018. She resided in Cantonment, Florida for 34 years. She was born in Savannah, Georgia and later moved to Odum, Georgia. Carolyn was a daughter of the late Lamar Wester and the late Dorothy Wester. She retired as a Revenue Specialist for the State of Florida. In addition to her parents, she was preceded in death by a sister and brother-in-law, Marilyn and Carey Wilson; and a brother-in-law, Miles Black. Survivors include her husband, John N. Helmken III; son, “Little” John N Helmken; two daughters, Laura Helmken Baugh and her husband, Stephen Baugh, and Donna M Dowd; granddaughters, Amanda Cherry and Stephanie Heisler; great-granddaughters, Abigail Hottel and Maddison Cherry; brother, Dr. Darrell Wester and his wife, Pam Wester; sisters, Gwen McCamish and her husband, John McCamish, Jackie Black, and Jan Webber and her husband, The Reverend Danny Webber, and numerous nieces and nephews. The family will receive friends from 10 until 11 o’clock Monday morning, December 3, 2018, at Gamble Funeral Service – 410 Stephenson Avenue. The funeral service will be held at 11 o’clock Monday morning, December 3, 2018, in the chapel of Gamble Funeral Service conducted by Pastor Peter J. Hartmann. Interment will be in Bonaventure Cemetery.